The Katschberg-Rennweg region is celebrated as an excellent region for hiking, climbing and fun family holidays. Though small, it has lots to see and do. The area of Katschberg-Rennweg is situated in Carinthia, the southernmost state in Austria. It lies near the Hohe Tauern and Nockberge Mountains (in the north-west of Carinthia) and has a great location between the regional capital of Klagenfurt and Salzburg. In fact, it only takes between sixty to ninety minutes to drive to either of these cities. Nestled in the Eastern Alps, Katschberg-Rennweg has a distinctly Alpine flavour, with altitudes of between 1,640 (5,381ft) to about 2,220m (7,283ft). The cultural atmosphere is very much epitomised by the traditional Austrian villages and hamlets in the region. Likewise, the local cuisine is about as typically Austrian as you can get, with plenty of Wiener Schnitzel, Roast Pork, Dumplings and Apfelstrudel featuring on the restaurant menus. The two best known places in the region are the market town of Rennweg am Katschberg and the skiing resort of Katschberghöhe. Both provide during the warmer months the ideal base for visitors wanting to explore the surrounding area on foot or by bike. Beyond these resorts, the scenery is dominated by the mountainous backdrop, with rolling Alpine fields, dense pine forests and dramatic gorges; in short, ideal terrain for hiking. Seasoned walkers will appreciate the challenge of the mountain trails, and those travelling with the family will benefit from the shorter, simpler routes through the meadows. It’s an area famed for its firm focus on promoting good health, and as a result, you’ll discover plenty of lively outdoor activities, suitable for visitors of all ages. Though a popular holiday destination, Katschberg-Rennweg manages to maintain a fairly laid-back ambiance, whilst offering plenty in the way of outdoor adventure. The area is very much geared towards outdoor activities of all kinds, and there are many walking paths in the area, both in the mountainous areas and the flatter terrain. In particular, the walk along the Lieser River (in Pöllertal) is wonderfully scenic, and gives walkers the opportunity to paddle in the shallow sections of the river itself. Continue the hike to Kochlöffelhütte and you’ll be able to catch the ‘Choo-Choo’ train back, which is always guaranteed to delight younger travellers! There are frequent mountain huts along the hiking trails and on mountain tops, offering a welcome place to pause, have a snack and admire the views. The Adlerhorst hut (the highest in the region) offers particularly impressive panoramas of the surrounding mountains, and is 2,222m (7,290ft) above sea level. It can be reached as part of the Katschberghöhe walk, or alternatively, you can take the Aineck chair lift. Katschberg-Rennweg is known for its plentiful outdoor activities, so visitors won’t be short of things to do when in the region. In addition to the excellent walking, mountain biking is popular; or if you’d prefer to take it a bit easier, hire a hi-tec E-bike, which makes pedalling consierably easier. Children and adults alike are sure to enjoy a horse-riding session through the pretty alpine forests, or for something a little more fast-paced, there is a quad-bike racing course at Katschberghöhe. Alternatively, visit the Katschberg Adventure Park, which boasts the impressive claim of being the largest high ropes course in the country. There are 170 stations in total, and visitors will require a certain level of skill and stamina to swing from tree to tree. 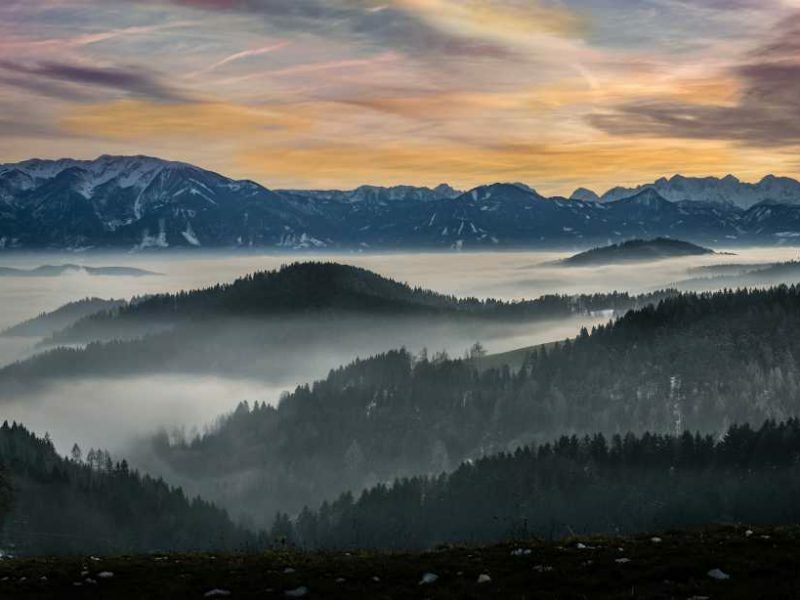 The UNESCO Salzburger Lungau and Kärntner Nockberge Biosphere Reserve, with its mountain peaks and dramatic valleys, not only has tremendous biodiversity, but also offers wonderful landscapes for keen walkers to explore. Wildlife fans may want to try to spot one of the Biosphere Reserve’s notable inhabitants; which include Eagle Owls, bears, lynxes and black woodpeckers. If the weather isn’t quite as sunny as hoped for, there are plenty of things to do in the regions nearby. The medieval town of Gmünd has some spectacular old buildings, an impressive Alte Burg (Old Castle) and a museum (located in the Town Hall). Car enthusiasts may also want to visit the Porsche Automuseum, which is where the Porsche dynasty first began. Gmünd is about 20km (12.5mi) from Rennweg am Katschberg. The nearest airports to the Katschberg-Rennweg region are at Salzburg and Klagenfurt. Both airports are under one and a half hours’ drive away, and Katschberg-Rennweg is well linked by the A10 motorway. If you prefer, it’s also possible to travel by train to the region. There are stations at Bischofshofen and Radstadt; and from there, you can catch a connecting bus to the Katschburg-Rennweg region. Alternatively, you can take the train to Spittal-Millstättersee, then catch a bus.